Creating a Bootable USB Flash drive to "Boot DOS from USB", can be complicated. However, a tool called Rufus, created by Pete Batard, can make this task simple. Rufus can also be used to create a Bootable USB version of a given distro from an ISO or image File. Rufus was originally similar in appearance and operation to the HP USB Format tool "HPUSBFW.exe", and shares many of the same features. However, Rufus is Open Source. NOTE: This post was written in 2011. Rufus has since evolved into a tool that can be used to format, create master boot records, and install an ISO or Image based distributions to USB. Much like the Universal USB Installer (UUI). WARNING: The following instructions are outdated! 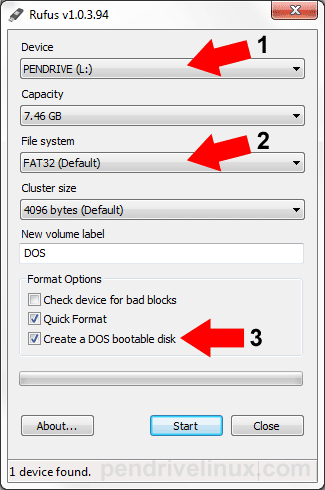 How to Create a DOS Bootable USB Flash Drive that can ultimately be used to Run DOS from USB, using Rufus. Restart your PC, setting your BIOS to boot from the USB device, boot and enjoy!